Membership gives you entry to the show as well as parking within the showgrounds! We are always in need of new ideas and enthusiastic volunteers to ensure the Cooma Show keeps on entertaining both locals and visitors of the Monaro. 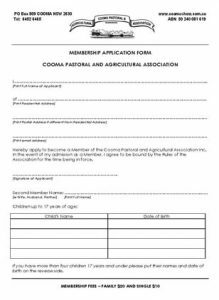 The Cooma Show Society welcomes new members to help keep the agricultural show running. If you would like to join, download the Membership Form and return it to the Secretary.